So, as we all know, the cream-coloured trench coat that Alice wore in New Moon has proven to be pretty damn elusive. I’ve never seen anything like it on Ebay, but there’s also a good reason for that: I’ve never known what I’m looking for! Banana Republic sells a wide range of trench coats for both men and women, though, so I decided to e-mail their customer service and find out if the trench coat belonged to them. I was also working on another hunch: Alice wears two scarves by Banana Republic in New Moon — the one she wore on the morning of Bella’s birthday, paired with a blue coat from Zara, and the one she wore with the trench itself, called a Banana Republic lightweight cashmere scarf. Thank you for your e-mail . Unfortunately, as the Trench coat has been removed from our inventory, we no longer have access to the item or style number. We apologize for any disappointment or inconvenience this may cause. As a fashion retailer, we continually strive to create new designs and, as a result, our collections are constantly changing. As to if or when we’ll offer this style of Trench coat again, we are not sure. Once again, we apologize for any disappointment this may cause. We hope you will continue to enjoy viewing our latest fashions at bananarepublic.com. If we may be of further assistance, please contact us at custserv@bananarepublic.com or by calling 1-888-BR-STYLE. If you are calling from outside of the U.S. you may also reach us at 1-614-564-2280. There are good and bad things about this trench. 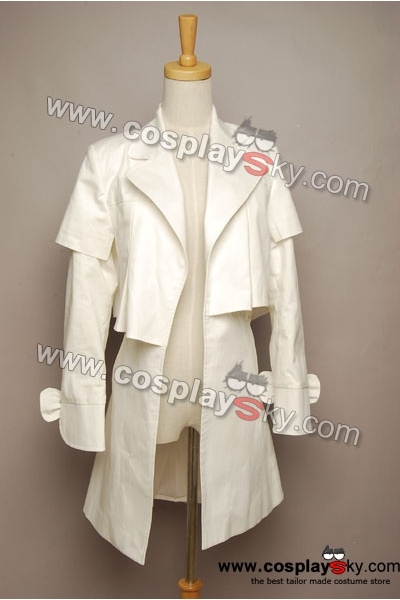 Cosplay Sky makes their products to fit the measurements you provide them with. That provides a more tailored fit for your costumes. Let’s be honest: you probably aren’t going to find a closer alternative than this one. I’ve never seen another coat that has the same venting at the back, the bow detailing on the sleeves, or the unique draping of fabric over the breast. Reviews of the jacket say it’s a blinding white in real life, rather than the cream that Alice’s appears to be. The thought of getting it dirty makes me shudder. It doesn’t look like it’s made with the same quality and care as the real jacket. Cosplay Sky has some replicas that look identical to the original — say, that Zara blue coat I mentioned — but this isn’t one of them. It doesn’t live up to the original in the sample photos, period, but maybe it looks better when it’s on. It doesn’t have any buttons! Alice’s trench most definitely has buttons, even if she doesn’t use them. I feel like I couldn’t use this coat as anything but a costume piece without them, because who wants a coat that isn’t actually going to keep you warm? So I have to ask: now that we know who made the New Moon trench, is anyone out there going to look for it? If they re-released it, would you buy it? Or would you rather go for the Cosplay Sky replica instead? Does anyone own the look-alike and want to share pictures of how it looks or any further reviews? I’d love to hear from you! I think the bows might just be added by the costume department. For an Alice flair. I’ve looked at trenches on ebay and there are so many similar ones, but without the bow. I’m thinking the costume department added the bows themselves. i’ve noticed that on the actual trench, if you look at it close up, it doesn’t look like she’s got bows at the wrists. they just look like regular buckles. am i crazy, or does anyone else see that? Yeah the more I look at it, it just looks like a bow. But its just the buckle and how the fabric lays. I mean the bows are cute on the cosplaysky one. But it doesn’t look like Alice’s has bows now that you mention it. That is too funny. Thanks so much for finding this! I had read on the Coolspotters site that someone thought it may be Banana and I e-mailed them and they had no idea what I was talking about! Then I got bored and text KGB and they told me it was Michael Kors! i think it was me who suggested it was a banana republic trench on coolspotters, just because tish monaghan listed it as a brand she dressed alice in. that’s so weird, though! we need to start ebaying “michael kors trench” now just in case! Do you by any chance know the designer/brand of the shirt and vest she wears underneath the trench? The brand doesn’t really even matter too much I just never know what TYPES of clothes they are, so I don’t know what to put into google or ebay to search for. thanks SO much for all your help! i don’t, unfortunately. but to be honest, i don’t think that matters as much because the outfit has so many outside layers that partially obscure what’s inside the jacket. all you really need is a dark gray fitted vest, a cream coloured shirt with ruffles at the collar, black leggings that hit your ankles, and black flats for the outfit beneath to look authentic. Is there any alternative to the Michael Kors Grey Ombre Cocoon Jacket she wears? it’s not perfect, but i actually like it more. i personally think the whole volterra getup was hideous. i agree. my friend theorizes that they have a database but didn’t want to give the item name and number to me so i wouldn’t turn around and buy it somewhere else. she thinks i might have more luck bringing a picture of alice into a banana republic location. Ok so I talked to two of my co-workers that use to “moonlight” at Banana. One said that she was going to ask around to see if the jacket looked familiar to any of the current employees, and she said that she will refer to their “Knowledge Book” whatever that is. The other employee said that Banana is worthless and my only luck would be to check out their outlet store. Hope that’s somewhat of a help. Will keep posted. that’s a great idea. let us know if you find anything out! So what are the odds that this was just a basic trench coat that was altered by the costume department? I have been looking for this damn thing for almost a year now with no luck. My co-workers that work(ed) at Banana say they’ve never seen anything like that. But yet BR Customer Service was very hesitant to disclose anything. I’m about ready just to buy a trench coat and make the additions myself. I think this is such a cute alternative to Alice’s Italy coat!! Speaking as a BR employee who answers your emails. When Shelly said it had been removed from inventory, that meant it’s over 2 years old. We only have specific item data in our system for 2 years. Last night, we went through three years of product books (basically picture books w/ items that would be featured at BR.). In three years (that’s 12 seasons) going back to 2008, we were unable to locate this coat. Usually trench coats are featured items in our books, but we have yet to locate one that’s even similar. Not saying absolutely that it’s not BR, but we can’t find it. Try going to gapinc.com and email from the media contacts and they might be able to provide more info…or at least a firm yes or no as to whether it’s BR. I know this post is old, but I stumbled across it during my daily online forage for trench coats.